Each year, thousands visit beautiful Lost Lake, one of the most beautiful and iconic places in Mount Hood country. The view of Mount Hood mirrored in the lake has been photographed countless times and has graced hundreds of postcards, calendars and scenic books. Some visitors to the lake climb the old lookout trail to Lost Lake Butte, which provides a sweeping view of the mountain, but only glimpses of the lake as once-burned forests continue to recover there. Yet, not long ago, another dramatic view was possible: Lost Lake nestled in the forests beneath Mount Hood, framed with blooming Pacific Rhododendrons. This scene was captured from the crest of Raker Point, a rocky spur due north of Lost Lake, and briefly a forest lookout site in the early 1930s. The view from Raker Point appeared in early postcards, and was later captured by Oregon’s famed photographer Ray Atkeson (above) in images that appeared widely in calendars, postcards and even automobile ads (below) in the 1950s. Ironically, the famous images captured by Atkeson were made possible by the industrial logging that began sweeping our national forests in the decades following World War II. By the late 1940s, a logging spur pushed over the saddle between Sawtooth Ridge and Raker Point, providing easy access to the spectacular view, even as it enabled the destruction of old growth forests that once grew there. Today, the old logging road to Raker Point has been decommissioned by the Forest Service and the clearcut slopes are slowly recovering. Now, Raker Point has become all but forgotten. Raker Point isn’t the tallest or most impressive among the Cascade peaks that rise up around Lost Lake, but it is the best positioned for a grand view of the lake and Mount Hood. Raker Point can be seen from the Lakeshore Trail, where it rounds the south end of the lake, as shown above. When the Forest Service first brought a road to Lost Lake and lookout towers to the Lost Lake area in the 1920s and early 1930s, Raker Point was much more prominent, thanks to wildfires in the early 1900s that had cleared both Raker Point and Lost Lake Butte. Their open summits made ideal forest lookout sites. 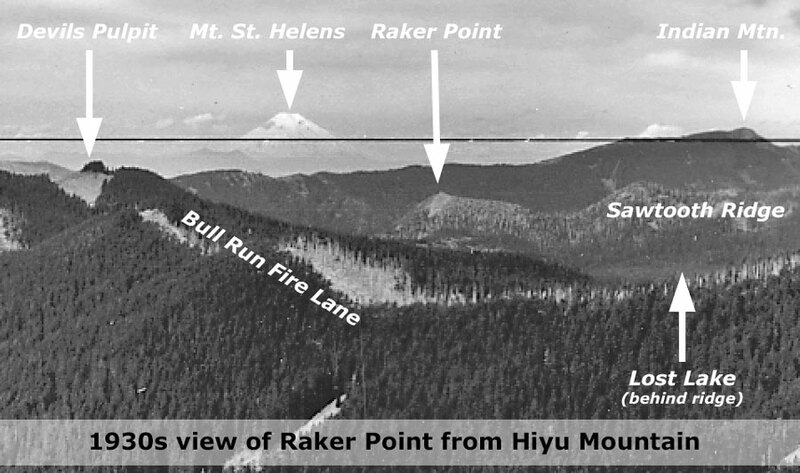 The origin of Raker Point’s name is unclear, but it’s likely that an early Forest Service ranger or surveyor named the peak — and perhaps was the namesake, too? Today, forests have returned to all but the rocky summit and surrounding talus slopes on Raker Point. This view (below) from the Lake Branch Road shows the now green slopes, with just a small opening near the top of the butte. Does this mean the classic view of Lost Lake and Mount Hood captured by Ray Atkeson in the 1940s has been lost? While rhododendrons may not thrive on the summit, the views of Mount Hood and Lost Lake are clearly still intact, though probably framed in Noble fir boughs and drifts of huckleberries. The Lost Lake area already has a fine network of trails, but a new route to Raker Point would bring needed opportunities to this popular recreation area. First, the classic view from Raker Point is reason enough to warrant trail access to the summit. But a trail to Raker Point would also serve as a more attainable challenge for families visiting Lost Lake. Today, hikers can make the 2-mile trek to the summit of Lost Lake Butte. Yet, while the view from there is excellent, it pales in comparison to Raker Point. More importantly, a trail to Raker Point would shave 400 feet of elevation gain in half the distance compared to the Lost Lake Butte hike, making it much more accessible to casual hikers and families with young children. 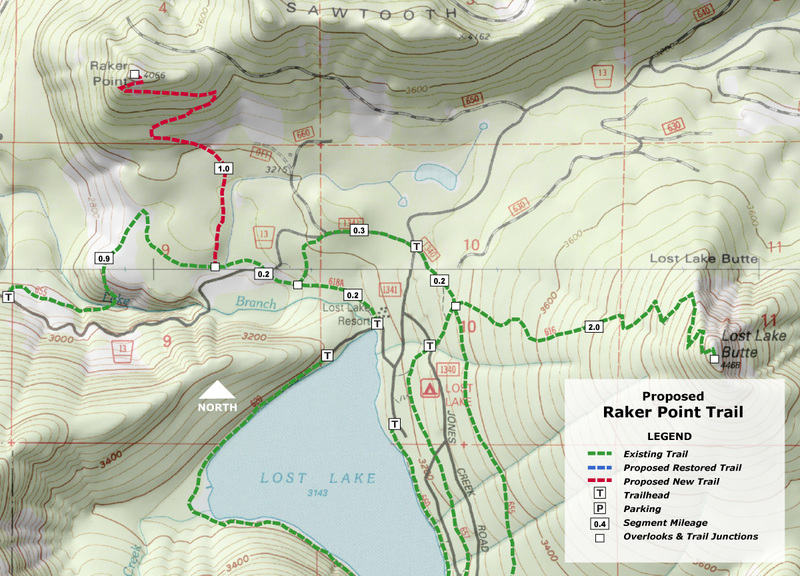 The proposed trail is simple: it would begin along a segment of the Old Skyline Trail that traverses the base of the Raker Point, and connects to the nearby campground, resort cabins and lodge at Lost Lake. Trail building would be straightforward, as well. The area is outside protected wilderness, so would not present limitations on the use of power saws and or other heavy equipment in the construction. The modest 1-mile length of the proposed new trail also puts it within financial reach in this era of cash-strapped federal land agencies. The new trail would also be accessible from trailheads along the Lake Branch Road, allowing hikers to visit the trail without adding to the crowds and congestion at Lost Lake, proper. What would it take to make this happen? Interest from Forest Service officials, for sure, but support from the Lost Lake Resort operators, in particular, could put this new trail on a fast track. The resort would clearly benefit from a new family-friendly trail option near the lodge, and would be powerful advocates if they were to bring this argument to the Forest Service. So, consider mentioning the idea if you happen to visit the resort this summer..! Postscript: at about the time I was writing this article, uber-adventurer Paul Turner was exploring Raker Point and nearby Sawtooth Ridge. He posted some excellent photos from his trip over here on the Oregon Hikers forum. Thanks, Paul!